So I've been wanting to start this for a while now, which is a specialized staff for either the Mana Specialists or other interested group to carry. Thus we'd have some warning if nether is about in the places we go and visit. 2. The staff has places to insert foci, which with the field the mana plants give off can take the edge off of us having to use our own mana to power said foci in low mana areas. While not perfect, its like having a small battery to take the edge off the mana user, like how my Prius is an electric/gas hybrid and thus I don't use as much gas as a regular gas car (but I still use some gas). It's really a simple thing, the plant itself in encased in either a crystal/glass bowl or a clay bowl (more likely) as we do it with plants all the time, put them in bowls with just some rocks and water and the plant's fine. Hydroponics on a small scale. However we can do a neat trick with dirt and fabric as well, which may be more stable when waving your staves around. So, plant the mana plant in dirt in the little ceramic jar and put some fabric (like burlap) with a hole so the mana plant can stick through, yet keep the dirt in and again, just add water on occasion and plant is happy. Plant really are versatile little boogers. 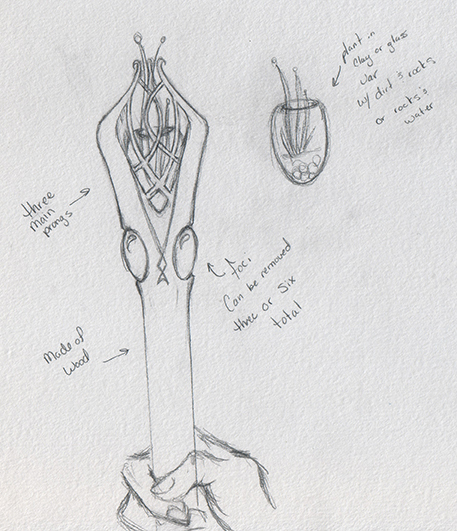 So there it is, my mana staff idea, which I will post in the future for votes and hopefully we can make some. Voting on it because i think its a good idea and its a original one.